What is the Brush Wizard? Started in 2012 , The Brush Wizard is the hobby love-child of Michigan native, Scott Ferguson. It began as a place to ramble about all things having to do with the lifelong hobby of painting miniatures, as Twitter is rather limited on providing in depth content. Since then it has grown into a place where you can find details on projects that are in progress, rambling write ups on table top/board gaming products, as well as tutorials to help you with your own painting wizardry. But, who is Scott Ferguson? I've been a gamer for as long as I can remember. As a child of the 80s I grew up with classic board and video games. I began painting models in the early 90s when my cousins and I discovered miniatures and Dungeons & Dragons. 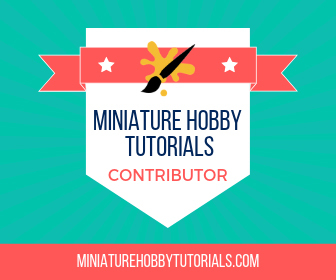 We each tried our hand at painting miniatures and I was hooked immediately. Sometime around 2011, I started posting my work on Twitter and since then I've accumulated a decent following and that's pushed me to improve even more, constantly looking to challenge myself and make my next paint job better than the last. I paint and craft for the love of the hobby, not for awards or accolades. That said, I have put my hat in the ring at the Crystal Brush at Adepticon 2017 and made it to web voting, which was a nice accomplishment. My skills also landed me a place as a judge for the inaugural Golden Kobold chibi painting competition at GenCon 2017. So welcome to The Brush Wizard. Have a look around, I'm always thinking up new projects and new ideas for articles. You can also follow my antics on Twitter and Instagram as well as on Twitch with Hobbyistgirl on Monday and Thursday at 8pm est.